Readers Question: Is “national debt” interchangeable with the term with “foreign debt”? National Debt represents the total amount the government owe the private sector. National debt builds up because the government spend more than they receive in tax. So they are different things. The UK measure of National debt is termed the public sector borrowing requirement. Some of the National debt is financed by selling bonds to oversees investors. 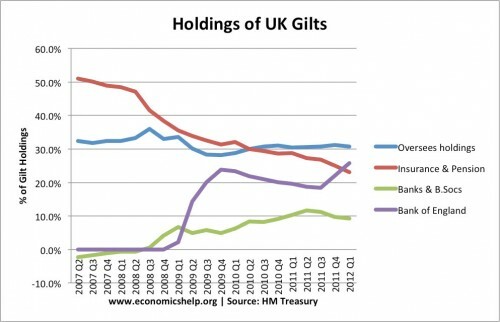 But, most of the UK National debt is bought by domestic financial institutions. What is the UK External Debt? According to National Statistics the UK External Debt – Gross is £6,290 bn (this is roughly 430% of GDP) (of which only £26bn is owed by General government). The biggest balance is the banking sector which owes nearly £4,000 bn. These banking liabilities should be cancelled out by an equal amount of foreign assets. Though if these assets deteriorated, the UK’s position would definitely worsen. But, they aren’t quite as shocking as they might first appear. 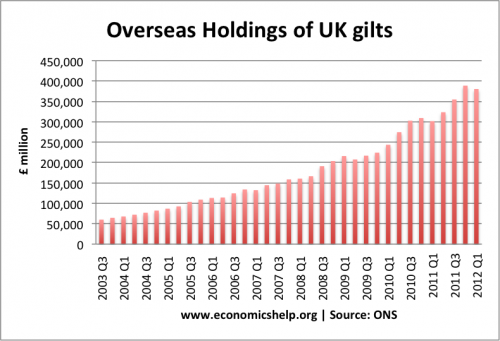 How Much of UK Government debt is held by Overseas investors? ← An Olympic Bounce for the Economy?